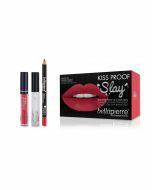 Kiss Proof Lip Finish is the perfect pairing to any Kiss Proof Lip Creme; adding a beautiful glossy sheen without disrupting or moving the Lip Creme underneath. Remarkably, your lip color will still be transfer-proof! Tip: can also be worn alone for a natural looking, glossy lip. With lips slightly parted, draw lip outline with applicator tip. Then, fill in empty space with a smooth, thin layer.